Here are the top ten tips for a “green” Halloween. They’ll save you money, too! 1. Reuse costumes. Tap into the treasures hidden in your closet or attic to pull together a fun, no-cost costume (it won’t take any longer than going to the mall, and will be a lot cheaper). Trade costumes with friends and family if you don’t want to wear last year’s get-up. Shop for accessories at yard sales or resale stores. Use your imagination but don’t obsess. The point is to have fun, not be fashionable! 2. Trick and treat. In lieu of junk food, hand out pencils made from recycled paper, erasers, nickels or dimes – be creative!. My husband used to live in the same neighborhood as baseball legend Casey Stengel – he gave out silver dollars. My neighbor started doling out small cups of apple cider when she realized how much kids love a drink of something when they’re running around like banshees. NatureMoms offers lots of great links to organic lollipops and other fun and healthy treats. 3. Reverse trick and treating. Global Exchange is encouraging kids to help educate adults about Fair Trade cocoa by handing Fair Trade chocolates back as they trick or treat. The chocolates are attached to a card explaining why Fair Trade offers an alternative to child labor, low wages for farmers and a healthier environment. Order by October 13. 4. Have a party. If you opt to celebrate at home in lieu of trick or treating, put out bowls of snacks rather than serve up individual throwaway treat bags. Offer pop corn, hummus and pita chips, carrots and dips, fresh apple cider, bat-shaped cookies and muffins. Kids will enjoy painting pumpkins, decorating cupcakes, reading scary stories, bobbing for apples, and going on “flashlight hunts” in the yard (if the party’s after dark) for hidden Halloween surprises. Send electronic invitations to avoid wasting paper and postage. 6. Light up the night. If you string lights (especially to keep walkways safe for kids), use strands of LEDs like these fun spider lights. They use much less energy than conventional holiday twinklers. Illuminate carved pumpkins with candles from beeswax or soy . Decorate windows and glass door panes with these beautiful non-toxic window paints from Hearthsong. If kids need flashlights to get around in the dark, try the BOGO light recharged with solar energy. 8. Try a new bag. The best option for candy collectors is last year’s bag; a pillowcase; or a reusable shopping bag with handles. 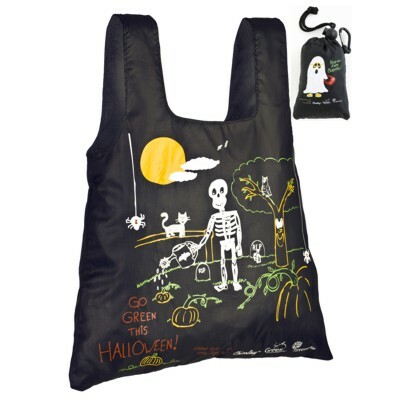 But if you need something new, try the reusable Chico Halloween Bag. Kids will love its spooky design. You’ll love that it only costs $5. 10. Get even more ideas. Between Green Halloween and the Green Moms Carnival , you’ll find everything you need to know to make your spooky night as eco as possible. The Portable Baby Blog also lists a number of organic, Fair Trade and/or more-natural snacks to hand out (ie w/fewer or no synthetic ingredients and what not). I'd like to take a moment of your time to introduce www.whatsurbag-usa.com , the company that designs and manufactures its-laS-tik: the only fashionable, flexible AND socially responsible reusable shopping bag on the market. its-laS-tik bags are FASHIONABLE: They come in a variety of the hottest colors and patterns and follow the global fashion trends. its-laS-tik bags are FLEXIBLE: They stretch and bounce eliminating stress on your shoulders, arms and back while holding twice the amount of groceries as a plastic or paper bag. And they feel light as a feather. its-laS-tik bags are SOCIALLY RESPONSIBLE: They are made in New Orleans in a factory ravaged by Hurricane Katrina and rebuilt by survivors. 5% of profit goes to Hope House, a non- profit organization in New Orleans that assists the homeless, and what'S ur bag partners with Hope House to recycle the bags in a program that helps the underpriveleged and the environment. 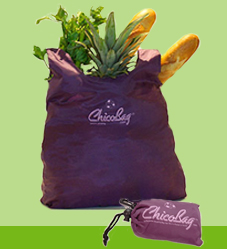 its-laS-tik bags can be branded with a company logo sold as is or used as a fundraising item for your organization. Those are all very good ideas, Ms. MacEachern. While we've not yet recycled costumes, we are trying to get more use out of them with our four (kids 10yoa and younger). My wife started a "dress up tub" -- a large plastic tub where we put many of the costumes the kids have outgrown, along with other dress up items. They come in handy throughout the year -- not just Oct. 31. Nice! Sometimes I get caught up in a holiday and forget about what's important. Thanks for reminding me to stay grounded when it comes to costumes and decorating. You're welcome. Have a fun Halloween! I love that Halloween treat bag! It is so adorable!